Review of BlenderBottle Classic 20 oz. and 28 oz. This is the summary of consumer reviews for BlenderBottle Classic 20 oz. and 28 oz.. The BoolPool rating for this product is Excellent, with 4.60 stars, and the price range is $6.53-$9.99. The BlenderBottle Classic is made of heavy plastic with embossed ounce/milliliter markings, large drink/pour spout and wide mouth. The stainless steel BlenderBall wire whisk is the heart beat of this bottle. Simply drop the ball in the bottle with all ingredients, screw the lid firmly on the cup and press the flip cap tightly till the snap is heard to avoid leaks or spills, and then shake well. The ball moves freely throughout the bottle mixing even the thickest ingredients with ease leaving no room for any chunks or lumps. The ball is designed to stay in the bottle along with the contents making it safe to consume. The GripperBars make it easy to hold for the best mixing action. These bottles can be used from 8 to 28 ounce capacity and are dishwasher safe, making them easy to clean. The bottles are BPA-free and easily fit in most car cup holders. However, the BlenderBottles are not microwave safe and are not suitable for warm or hot liquids as it may build up pressure within the bottle causing the flip cap to open unexpectedly spraying the contents all over. It is also seen that it is difficult to get rid of protein powder smells if not cleaned immediately. Overall, the BlenderBottle Classic has unlimited possibilities for blending great-tasting drinks or nutrition/protein shakes, salad dressing, pancake batters, yogurt smoothies, lump-free gravy, and pudding or for as simple as carrying water. It can be used in kitchen, offices, gym or while travelling. The bottle is surprisingly effective, comes at affordable price and is available in many attractive colors. I mostly only mix gold standard whey and it mixes easily without the need for the blender ball or other accessories some of these bottles come with. Bottle And cap are good quality but its all about the blender ball great product. the blender ball does a GREAT job at helping mix even thick liquids. Mixing is so much better and quicker with the blender ball. It mixes protein well, stores well, cleans easily, and fits in recepticles for cups. I was sick and tired of mixing individual bottles of formula when preparing daycare bottles so I was looking for something to mix a larger quantity of formula when I stumbled on this. This's a nice shaker bottle. The bottle is made of a heavy plastic making it both very durable and easy to clean. I used some other shaker bottles but their quality isn't as good as Blender. It's easy to clean & dishwasher safe. Fortunately, this blender bottle has simplified my life and made the protein shakes easy to blend. Clean up is easy also. Easy to clean, tight seal, and BPA-free. I bought this blender bottle so I could mix my protein shakes on the go. They're easy to clean, easy to carry, don't leak, wash them in the dishwasher with out them shrinking. The little wire ball is also easy to clean and the lid snaps down so tightly it never leaks!. This's the perfect shaker bottle for protein shakes that I've ever found. This bottle and ball gets my protein mixed in about 5 seconds with no clumping. If you drink health or protein shakes all the time, it's perfect. As for me, I drink bottled water everyday, and I find that mixing my protein powder with milk is easier in the empty water bottles than in the shaker. With a few shakes, it mixes up your protein drink just fine with its wire wisk ball. If you need a shaker bottle for your protein drinks or what've you, you've come to the right place. I use a shaker every day for protein drinks. Before I'd toss water and my whey protein into a 32 oz REI Nalgene bottle and shake it up, but I'd still get clumps of protein. It's pretty disgusting to be drinking a protein shake and take a bit out of a big clump of unblended whey powder. If you drink bottled water regularly, I suggest that you use your empty bottles to prepare your shake. I'm into fitness and drink protein shakes daily between meals. I bought my bottle from Energy First because I buy protein there. I drink shakes in the morning for breakfast and I was so tired of water/sports bottles that'd leak when shaken and would leave chunks of shake around the bottom rim of the bottle. Well after 1 week of drinking clumpy shakes, I bought two of these based on the positive reviews and great price. It mixed my protein powder easily, didn't leak or drip and I liked that the top tab didn't fall back in my face as I was drinking out of the bottle. This product not only evenly shakes the drink, leaving NO chunks, but it also kind of whips it...its pretty much chocolate shake milk that I'm drinking for breakfast and I love that (who wouldn't!). Never any problems with my protein shakes. Doesn't seem to get that "protein powder" smell if you forget to clean it immediately after drinking. I recently starting drinking whey protein shakes and thought that I could just stir vigorously enough with a spoon. 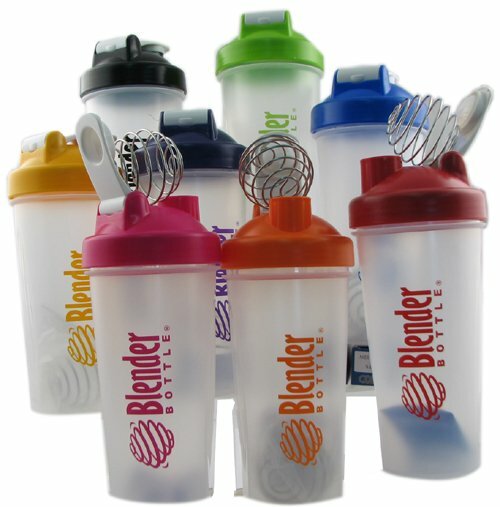 Review of - BlenderBottle SportMixer 20 oz. and 28 oz.